I gave in to the prospect of the only nice weekend weather Saturday morning before my dentist appointment and went to McGinnis Slough. Reports of waterfowl seen a day or two before reminded me it was time to renew my relationship with this favorite destination, and the prospect of fall colors made it even more enticing. So now it will be a month or longer, looking back on fall from winter soon, by the time I get around to the last organized bird walk weekend. The moment I got out of the car I felt restored. I was the only human and could temporarily forget about the whir of traffic noise nearby. There were still a few Red-Winged Blackbirds hanging out, singing. I was not expecting to see Yellow-Rumped Warblers…or orange conifers…but apparently both exist together. I think the tree is an American Larch or something like that, which turns yellow or orange in the fall. And here are two cute Coots up closer. At one point two Mute Swans flew overhead. The second time they weren’t entirely mute and I thought they sounded a bit like Snow Geese so they had me fooled for a minute, but my photographs later said Swans. The Coot below was enjoying the early sunshine, and so was I, but the clouds started to move in quickly after that. A Wood Duck was close enough for a photo but by then the sun was hiding. A few more of the Yellow-Rumpeds and the tree they were in. Sunday morning the choir sang two services, singing “Somebody Prayed for Peace” and “Sweet Freedom” which is based on the national anthem. Afterward I went to city hall for early voting, deciding that it might not be such a bad thing to try, even though I live half a block from my polling place. As I sat in the gallery section of council chambers waiting my turn at the voting machine, I was reminded of sitting in a church pew and struck by the metaphor of voting as a form of prayer. Random contributions from my new cell phone…the leaves are from one of the towering Sycamore trees I passed this morning on my way to the train, the salad consumed yesterday features the last of my cherry tomatoes, and beneath all that, one experiment in my new Saturday tradition which is to have one midday meal of scrambled eggs and onions and whatever else I’m looking to use up…in this instance, even some stale pita chips. Food as a form of prayer. One more landscape from McGinnis and a Red-Winged Blackbird looking thoughtful. This coming weekend will be very busy with the choir tour. I hope to return to this page soon afterward. I’ve had hummingbird feeders up since May. Three feeders in the backyard, and a couple weeks ago after a hummingbird hovered in my front yard, I added another feeder for the front porch. The best feeder for me is the one I can see while I’m standing at the kitchen sink looking out the window to the branch of the sumac tree it’s hanging from. And Saturday early evening my eye immediately followed that quick, darting flight of a hummingbird to that exact feeder. I grabbed the camera, went out the back door and waited. The hummingbird, a female Ruby-Throated Hummingbird, to be exact, decided she’d rather be at another feeder that hangs from the redbud tree, so that’s where I got these few pictures. But at last my wish was granted and hanging the feeders was no longer in vain. I didn’t see a hummer on Sunday, but last night after work I did see a hummer come to the farthest feeder hanging from the crabapple tree. Also in the yard late Saturday was a female Downy Woodpecker and a female cat that I often catch lounging on my back cement slab where once a tiny garage stood, but it seems she now has a new observation deck across the fence by the neighbor’s garage. She closed her eyes for the camera. After all this excitement I figured my chances might be good for finding a hummingbird at the Portage Sunday morning. so I got there a little earlier than I have been (when I pulled in, there were no cars in the parking lot) and sure enough, right around the first bridge over the duckweed, I found this lovely individual. I should mention that I mustered up the courage to take the Tamron 100-600mm lens now that I’ve enabled the back button focus feature, so I was able to get more pictures from farther away after being frustrated by the distances last week. Below, a couple Indigo Buntings. And juvenile American Robins in their ever-changing plumage are always interesting to see. There seemed to be a lot of juvenile Blue-Gray Gnatcatchers too. I think I caught this one after a bath. It wasn’t too difficult to find an obliging Cedar Waxwing. This one is enjoying Pokeweed berries and a staring match with the camera lens. I didn’t get great pictures of any individual American Goldfinches but they stand out against the duckweed palette below. Below, one very distant Tiger Swallowtail butterfly and another Indigo Bunting. When I stopped by the second bridge, I heard a White-Breasted Nuthatch but saw this Black-and-White Warbler foraging like a nuthatch on a tree. I lost track of the warbler but then found the nuthatch, below. I still had a little time so I decided to see if anything was up at McGinnis Slough. There was not a lot of activity. The large numbers of swallows and swifts were gone and nothing else had noticeably replaced their activity. But I did get a couple interesting photographs of three of the same species I had at the Portage. I have decided seeing hummingbirds at my feeders is appropriate consolation for not being able to view the partial solar eclipse yesterday. The safety glasses I ordered over a week ago never arrived, and I never received a reply to any of my email inquiries, so now I am digging in for a refund. Even if the glasses do finally arrive, I can’t plan to be around for the next eclipse, which is in 2024 and I’d have to travel to see it, let alone find the glasses 7 years from now. I did receive a camera filter in time for yesterday, maybe I can find another reason to play with it. I got up early this morning so I could go to the Little Red Schoolhouse Forest Preserve and then stop by McGinnis Slough. I haven’t been to the Schoolhouse in a long time so I made sure I covered every inch of it. I never heard or saw a Prairie Warbler, which would have been a life bird. I was satisfied to see a couple Tufted Titmice and to record a beautiful song of a Wood Thrush. In all, it was a pleasant visit for an hour and a half. The Slough is hardly a slough, the water levels have receded and it is covered with plant life, which has made it less attractive to a number of species I would have expected to see there. 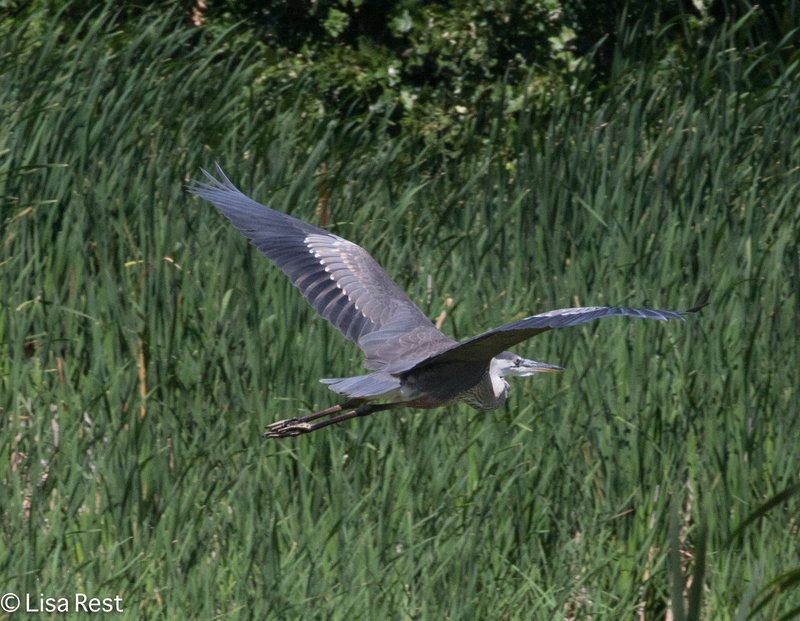 But there were several Great Blue Herons. When I checked my email, it became apparent that someone heard, saw and photographed the Prairie Warbler at the Schoolhouse yesterday, because it made the Rare Bird Alert which comes to my mailbox. That was disheartening. But I managed to get up the energy to download my pictures from the camera and start going through them, and that’s when I found this wonderful series of a Red-Winged Blackbird harassing a Great Blue Heron. I had been sitting on the picnic table that overlooks the slough from the northern end of the preserve, and suddenly these two characters were in front of me. I hadn’t even remembered taking these pictures until I saw them – that’s how quickly it all happened. One cannot plan for these things. The only thing I changed today was I finally set up my Mark III so I no longer have to use the shutter button to focus. I had done this already to my 70D over a month ago. I don’t know if it had anything to do with anything but I just feel really lucky to have taken these pictures. The Red-Winged Blackbird’s shadow makes two of him on the heron’s back! 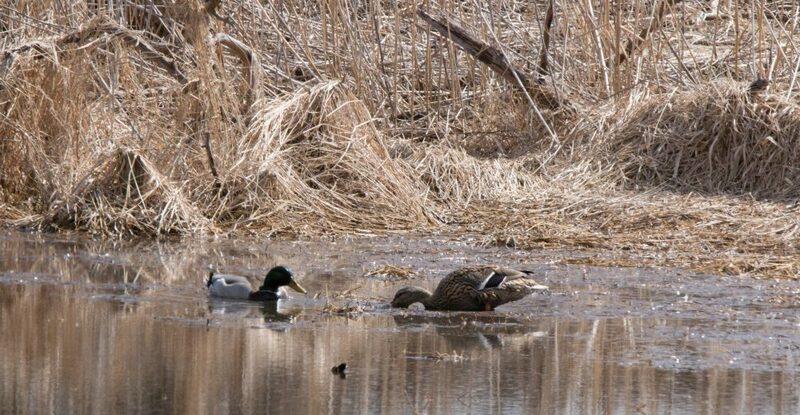 Weather permitting, I’m going to Goose Lake Prairie in Grundy County tomorrow. I had already planned to go, before someone found a King Rail there. That would be another life bird for me, but I’m not going with any expectations. Timing is everything.